Now or Never, Saving America from Economic Collapse by Senator Jim DeMint. During a lifetime of reading, I have read thousands of books. Except for a handful of truly bad books, I have read all of them from cover to cover since I like to finish what I start. I tried to read Jim DeMint’s earlier book, Saving Freedom: We Can Stop America’s Slide into Socialism, but gave up halfway through. When DeMint announced that he was resigning from the US Senate to work for the Heritage Foundation, I decided to try again. Now or Never is no better and no worse than Saving Freedom. Both books are full of mistakes and misleading statements, many sourced from Heritage Foundation publications. My favorite mistake in the book occurs on page 90 and again later in the book. 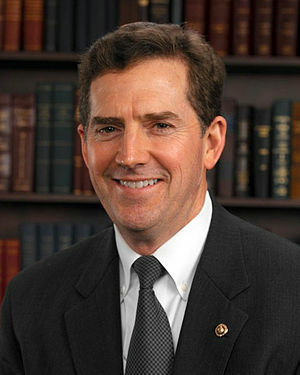 DeMint is advocating a constitutional amendment, Cut, Cap and Balance, and in error he states that constitutional amendments must be passed by a two-thirds vote of Congress (correct) and approved by two-thirds of the states (wrong). Constitutional amendments must be approved by three-quarters or 38 of the states. For someone who worships the US Constitution, that is an embarrassing mistake, made not just once, but twice. DeMint is completely against compromise. So it is probably best that is resigning from the Senate to head the Heritage Foundation. When he was elected, Ronald Reagan relied on a Heritage Foundation publication for guidance on policy. Thus we owe our present sad state of affairs to Reagan and the Heritage Foundation. Reagan’s drift to the right stopped in 2004 or before. The Heritage Foundation continues to evolve farther and farther to the right. If DeMint insists on defeating Democrats rather than working with them, I think that Democrats are justified in defeating both DeMint and Heritage. A mandate is a mandate or am I missing something? 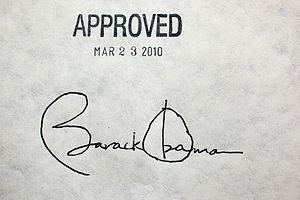 The Heritage Foundation, a right-wing think tank, and Mitt Romney have both supported healthcare mandates in the past. Now both are saying that the mandate in Obamacare is different from what they proposed. What is the difference? In order to work, everyone must be covered so that the risks are spread between the ill and the healthy. If only the ill or those prone to illness purchase insurance, the rates will be too high for many of us to afford. Premiums from the healthy are required to make the system function. And the healthy can be struck with accident or illness at any time. Then it will too late to purchase healthcare insurance. Just try to buy auto insurance after you have had an accident or a vehicle stolen. In my opinion, that honor belongs to George W. Bush, surpassing the previous holder of that dubious honor, James Buchanan. Hardly a day passes without someone on the web stating that Barack Obama is the worst president ever. Their posts are usually a laundry list of some of the false assertions made against the President. In other words, a pack of lies. The housing bubble and the aftermath could have been decreased in magnitude and the severity of the aftereffects if Bush and Alan Greenspan had taken action sooner or at all. All homeowners or those who want to be are poorer because they did not act. The Global War on Terror could have ended at Tora Bora, Afghanistan in late 2001 if Bush had pursued bin Laden and al-Qaeda with greater vigor when most of them were surrounded. Instead al-Qaeda still exists, and their existence is used to justify all sorts of intrusions in our daily lives. Such as airport screenings, monitoring of electronic communication in all forms and unjustified wars in Iraq and elsewhere. The Bush tax cuts were designed to reward the 1% and at the same time make Grover Norquist‘s goal of a small government a reality. Ronald Reagan tried to accomplish this in the 1980s using the Heritage Foundation‘s blueprint, but he failed because he lacked the current GOP’s ruthlessness. Those of us who rely on the government safety net are going to find that it no longer exists. 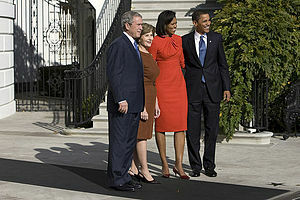 Bush used a record number of signing statements to enlarge the powers of the presidency at the expense of the other two branches of government. In 1776, we declared our independence of King George 3. In his reign, George W. Bush attempted to reinstate monarchy in the US. Barack Obama has the unenviable task of fixing what Bush damaged or destroyed. His task reminds me of Sisyphus rolling a rock uphill during the day and watching it roll downhill at night, only to repeat the uphill push the next day. Barack’s task is even more difficult because he has the current GOP on the uphill side pushing against the rock to make the task even harder. Rather than criticizing Barack for his limited success, those of us who support him should be helping him by putting our shoulders to the rock and aiding in the uphill push. We can succeed if we join in his efforts.